Why Does Dual Momentum Outperform? Those who have read my momentum research papers, book, and this blog should know that simple dual momentum has handily outperformed buy-and-hold. The following chart shows the 10- year rolling excess return of our popular Global Equities Momentum (GEM) dual momentum model compared to a 70/30 S&P 500/U.S. bond benchmark . Results are hypothetical, are NOT an indicator of future results, and do NOT represent returns that any investor actually attained. Indexes are unmanaged, do not reflect management or trading fees, and one cannot invest directly in an index. Please see our Performance and Disclaimer pages for more information. GEM has outperformed its benchmark over the long run, although the amount of outperformance has varied over time. In 1984 and 1997-2000, those who might have guessed that dual momentum had lost its mojo saw its dominance come roaring right back. In Chapter 4 of my book, I give some explanations why momentum has worked well. The reasons fall into two general categories: rational and behavioral. In the rational camp are those who believe that momentum earns higher returns because its risks are greater. That argument is harder to justify now that absolute momentum has shown the ability to provide higher returns and reduced risk exposure. The behavioral explanation for momentum centers on initial investor underreaction of prices to new information. This is followed later by overreaction. Underreaction comes from anchoring, conservatism, and the slow diffusion of information. Overreaction is due to herding (the bandwagon effect), representativeness (assuming continuation of the present), and overconfidence. Price gains attract more buying which leads to further price gains. The same is true with losses and continued selling. The herding instinct is one of the strongest forces in nature. It is what allows animals in nature to better survive predator attacks. It is a powerful primordial instinct built into our brain chemistry and DNA. It is therefore unlikely to disappear. Representativeness and overconfidence are also evident when there are strong momentum-based trends. Furthermore, investors' loss aversion may decrease as they see prices rise and they become overconfident. Their loss aversion may similarly increase as prices fall and they become more fearful. Studies have shown that investors are about 2 times more likely to avoid losses than they are willing to seek gains. These natural psychological responses are also unlikely to change in the future. One can make a sound logical argument for the investor overreaction explanation of the momentum effect with individual stocks. Stocks can have high idiosyncratic volatility and be influenced by news events, such as earnings surprises, management changes, plant shutdowns, employee strikes, product recalls, supply chain disruptions, regulatory constraints, and litigation. A recent study by Heidari (2015) called “Over or Under? Momentum, Idiosyncratic Volatility and Overreaction” looked into investor under or overreaction with stocks and found evidence that supported the overreaction explanation as the source of momentum profits, especially when idiosyncratic volatility was high. Many economic trends, not just stock prices, get overextended and then mean revert. The business cycle trends and mean reverts. Since the late 1980s, researchers have known that stock prices are long-term mean reverting . Mean reversion supports the premise that stocks overreact and become overextended, which leads to their mean reversion. We can make a case that overreaction in both bull and bear market environments provides a good explanation for why dual momentum has worked so well compared to buy-and-hold. Earlier we posted "Dual, Relative, & Absolute Momentum" that highlighted the differences between dual, relative, and absolute momentum. Here is a chart of our GEM model and its relative and absolute momentum components referenced in that post. GEM uses relative momentum to switch between U.S. and non-U.S. stocks and absolute momentum to switch between stocks and bonds. Instructions on how to use GEM are in my book, Dual Momentum Investing: An Innovative Strategy for Higher Returns with Lower Risk. Relative momentum provided almost 300 basis points more annual average return than the underlying S&P 500 and MSCI ACWI ex-US indices. It did this by capturing profits from both indices rather than from just from a single one. We can tell from the above chart that some of these profits came from price overreaction, since both indices pulled back sharply following their strong run ups. Relative momentum profits in this case are also aided by neglect as investors fail to capture more profit from non-U.S. stocks due to strong home country bias. Even though relative momentum gives us substantially increased profits, it does nothing to alleviate downside risk. Relative momentum volatility and maximum drawdown are comparable to the underlying indices themselves. We see in the above chart that absolute momentum applied to the S&P 500 created almost the same terminal wealth as relative momentum, and it did so with much less drawdown. Absolute momentum accomplished this by side stepping the severe downside bear market overreactions in stocks. As with relative momentum, there is ample evidence of price overreaction, since there were sharp rebounds from oversold levels following most bear market lows. We see that overreaction comes into play twice with dual momentum. First, is when we exploit positive overreaction to earn higher profits from the strongest market selected by relative momentum. Trend following absolute momentum can help lock in these overreaction profits before the markets can mean revert. The second way overreaction comes into play is when we avoid it by standing aside from stocks when absolute momentum identifies the trend of the market as being down. 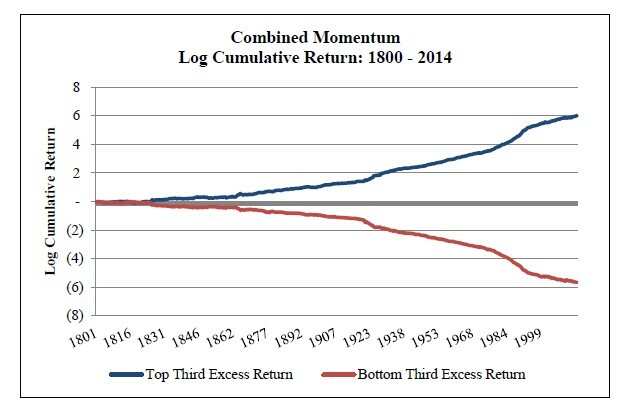 Based on this synergistic capturing of overreaction profits while avoiding overreaction losses, dual momentum produced twice the incremental return of relative momentum alone. And it did this while maintaining the same stability as absolute momentum. We should keep in mind that stock market overreaction, as the driving force behind dual momentum, is not likely to disappear. Looking at things a little differently, the following histogram shows the distribution of 12-month returns of GEM versus the S&P 500. We see that GEM has participated well in bull market upside gains while truncating left tail risk representing bear market losses. Dual momentum, in effect, converted market overreaction losses into profits. We can also gain some insight by looking at the comparative performance of GEM and the S&P 500 during separate bull and bear market periods. During bull markets, GEM produced an average return somewhat higher than the S&P 500. This meant that relative momentum earned more than absolute momentum gave up on those occasions when absolute momentum exited stocks and had to reenter stocks a month or several months later . Relative momentum also overcame lost profits when trend-following absolute momentum kept GEM out of stocks as new bull markets were just getting started. With only absolute momentum, the bull market average return would have been 214.9% instead of the 289.9% return that came from using both relative and absolute momentum. What really stands out though are the average profits that GEM earned in bear market environments when stocks lost an average of 37%. Without only relative momentum, the bear market average return would have been -33.1% instead of the 3.6% positive return that came form using both relative and absolute momentum. Absolute momentum, by side stepping bear market losses, is what accounted for much of GEM’s outperformance. Large losses need much larger gains to recover from those losses. For example, a 50% loss requires a 100% gain to get back to breakeven. By avoiding large losses in the first place, GEM has not been saddled with this kind of loss recovery burden. Warren Buffett was right when he said that the first (and second) rule of investing is to avoid losses. But increased profits through relative strength and loss avoidance through absolute momentum are only half the story. Avoiding losses also contributes to our peace of mind. It helps prevent us from becoming irrationally exuberant or uncomfortably depressed, which can lead to poor timing decisions. Not only does dual momentum help capture overreaction bull market profits and reduce overreaction bear market losses, but it gives us a disciplined framework to keep us from overreacting to the wild vagaries of the market. GEM has been in stocks 70% of the time and in aggregate or government/credit bonds around 30% of the time since January 1971. See the Performance page of our website for more information. See Poterba and Summers (1988) or Fama and French (1988). 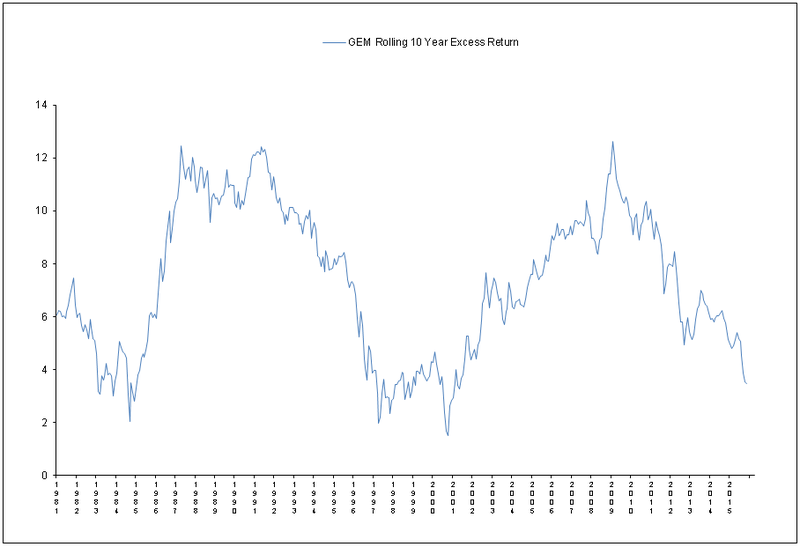 Since January 1971, there have been 10 instances of absolute momentum causing GEM to exit stocks and reenter them within the next 3 months, foregoing an average 3.1% difference in return. Several months ago we posted an article called “Bring Data” where we showed the importance of having abundant data for system development and validation. This was further reinforced to us recently when someone brought us additional U.S. stock sector data. Previously, we only had Morningstar sector data that went back to 1992, which we used to construct our Dual Momentum Sector Rotation (DMSR) model. (S&P sector data goes back to only the early 1990s.) 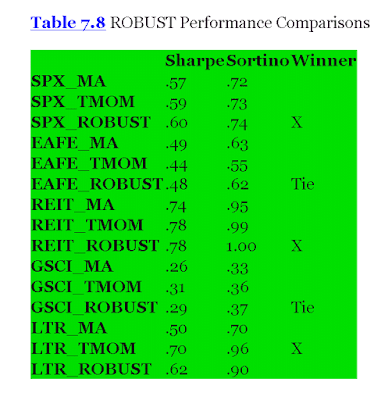 This is the amount of data that most sector rotation programs use to backtest their strategies. Because the monthly correlation between GEM and DMSR is only 0.59, sector rotation may still have a modest role to play in a diversified equities-oriented portfolio. But DMSR is not the best choice as a core portfolio holding. Sector rotation programs that use data no further back than the early 1990s to develop their models may be in for a rude awakening someday. Future drawdowns may be higher and returns lower than expected. The S&P 500 is highlighted in different colors for each 15 year period. You can see that the latest period, 1999-2013, looks different from the preceding period, 1984-1998. 1999-2013, in fact, looks more like the earlier 1969-1983 period. 1984-1998 is also different from its preceding period, 1969-1983 and similar to the earlier years 1954-1968. If you had used each 15-year period to develop your model, you would have had something unsuited for each of the next 15-year periods. You would have been better off using all four periods to formulate a model rather than just the last 15-year period. The more data you use, the more likely you are to have a robust model that will hold up reasonably well in the future, even though it isn’t the best fit to any one particular period. The 12-month look back parameter we use for our GEM and ESGM dual momentum models was found to work well in 1937 by Cowles & Jones. It has been used extensively in momentum research since then and has held up well out-of-sample. But there is a lot more history than that to help give us more confidence in momentum. Let's take a look at some of that now. We focus on stocks as our core asset since they have historically offered the highest risk premium to investors. U.S. stocks, in particular, have given investors the best long-run returns. Other assets can create a drag on long-run portfolio performance. They also lose some importance as diversifiers once you use a trend following overlay like absolute momentum to help attenuate your downside risk exposure. 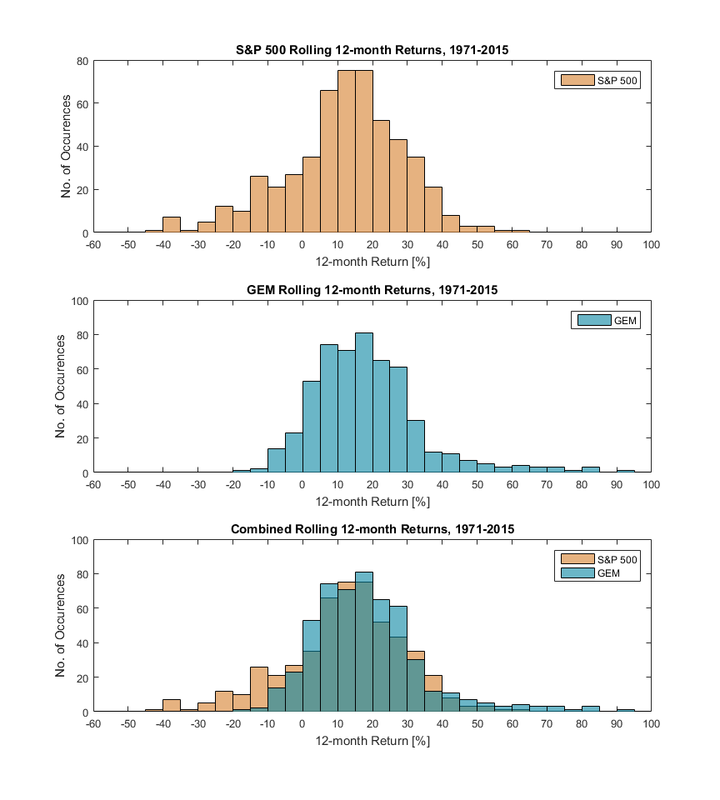 The longest back test on stock market momentum is by Geczy and Samonov (G&S). 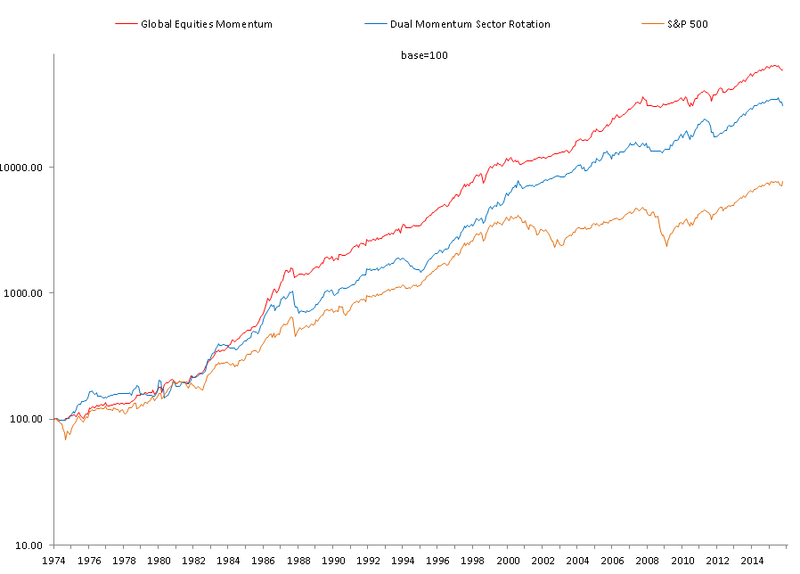 Their 2013 paper called “212 Years of Price Momentum: The World’s Longest Back Test 1801-2012” compared the top one-third to the bottom one-third of U.S. stocks sorted monthly by relative momentum. 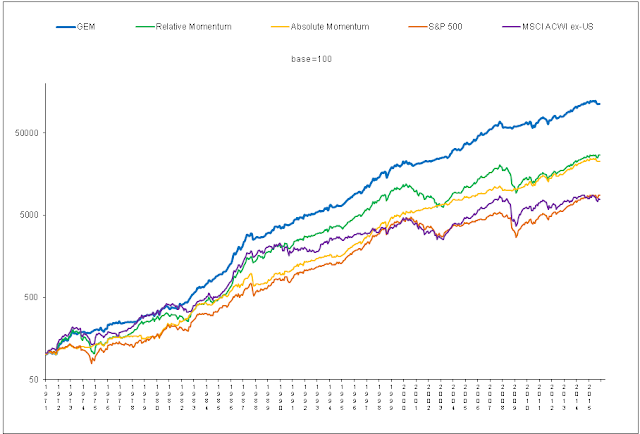 Over this entire sample period, the top equally weighted momentum stocks outperformed the bottom ones by 0.4% per month with a highly significant t-stat of 5.7. Prior to this study, momentum outperformance on U.S. stocks had been found significant back to 1926. G&S showed that stock momentum was also positive and statistically significant from 1801 to 1926. G&S also found that stock market momentum was remarkably consistent. In only 2 of the 21 decades from 1801 through 2012 did long-only momentum under perform buy-and- hold, and these were by just -1.2% and -0.7% annually. In all the other 19 decades, momentum outperformed buy-and-hold by an average of 3.8% annually. This year G&S came out with a new study called, “215 Years of Global Multi-Asset Momentum: 1800-2014: Equities, Sectors, Currencies, Bonds, Commodities, and Stocks.” Here G&S expanded their momentum study to cover six different asset classes, including bonds, stock sectors, and equity indices, which are the ones we use in our momentum models. 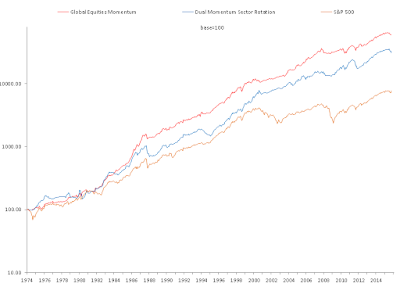 G&S demonstrated the outperformance of momentum inside and across all asset classes except commodities. Here is a chart from their paper showing the log cumulative equally weighted average of the 6 asset classes plus the cross asset momentum excess returns. 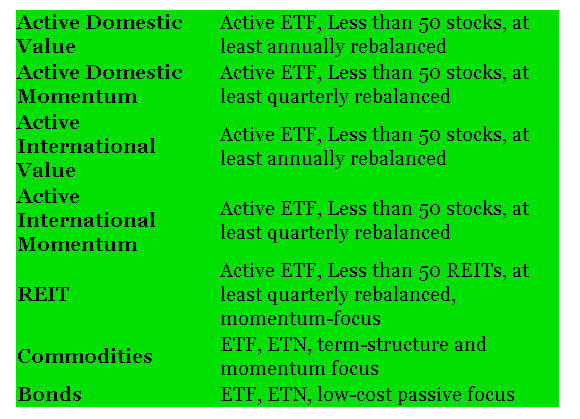 The strongest momentum effect is in geographically diversified equity indices, which had a long-only monthly excess return over buy-and-hold of 0.52% with a highly significant t-stat of 11.7, compared to 0.29% with a t-stat of 6.4 for individual U.S. stocks before transaction costs, which would be much higher for stocks. Country equity indices outperform global equity sectors, which is consistent with our updated findings. G&S also show that long-only absolute (time series) momentum outperformed buy-and-hold by 0.15% per month with a t-stat of 11.2. For those who want to further their momentum education, I suggest you read the seminal paper by Jegadeesh and Titman (1993) that started the modern momentum renaissance. Next, learn about absolute momentum from Moskowitz et al (2012) or Antonacci (2013). Then follow up with Geczy and Samonov (2015) to satisfy yourself as to the efficacy and robustness of momentum investing based on 215 years of empirical evidence. Equity indexes are equally as good as individual stocks (or better, according to G&S) in capturing the momentum effect. Indexes are much easier to use, avoid the enormously high transaction costs associated with rebalancing momentum-based stock portfolios, and are much less susceptible to scalability issues. They are still subject to though to high short-term volatility and significant periods of benchmark underperformance. Multi-factor investing that combines value, momentum, quality (profitability), or low volatility factors is today’s hot new investment approach. There has been an explosion of multi-factor ETFs recently with eleven of the sixteen existing U.S. multi-factor funds coming to market this year and five of them showing up within the past 60 days. But multi-factor funds can have their aome quirks and issues. If the larEditge variety of factors is a “factor zoo,” then multi-factor approaches are a “factor circus” with its own collection of silly clowns, dangerous acrobats, and amusing jugglers disguising multi-signal factor biases . With factor investing in general there are three problem areas: tractability, scalability, and volatility. Regarding tractability, it is well-known that value investing can have long periods of serious under performance. This happened in the late 1990s and also somewhat during the past two years. Not all value investors may be willing to see this happen without losing patience and giving up on their factor portfolios. Momentum and other factors are also subject to sustained tracking error. Scalability has to do with too much money chasing after too few stocks. Factors perform best when you can focus on those stocks having the strongest factor characteristics. For example, van Oord (2015) showed that from 1926 through 2014, only the top decile of U.S. momentum stocks outperformed the market. Stocks below the top decile added nothing to strategy results. But only two out of the twelve large cap U.S. equities single factor ETFs include only stocks that are within the top decile of their factor rankings. For example, the oldest and largest single factor value ETFs are iShares S&P 500 Value (IVE), iShares Russell 1000 Value (IWD), and Vanguard Value (VTV). They hold 72%, 69%, and 50% of the stocks that are in their investable universes. This makes them, to a great extent, closet index funds with relatively high fees. Their large sizes ($8.3 billion, $23.5 billion, and $34.6 billion) may impede them from focusing on just fifty (the top decile of S&P 500 stocks) or one-hundred (the top decile of Russell 1000) value stocks. The same is true with momentum. One of the largest momentum funds, with over $1 billion in assets, is the AQR Large Cap Momentum Style mutual fund with an expense ratio of 0.45. It holds 532 out of an investable universe of 1000 stocks. This is a far cry from the top decile of momentum stocks. AQR manages considerably more than this in the momentum arena through their hedge fund and multi-factor funds. Large amounts of investment capital may make it difficult for single factor funds to focus only on the small number of stocks that appear in their top factor deciles. The third problem for single factor portfolios is increased volatility and large bear market drawdowns that can accompany value, momentum, and small cap factors. Trend following filters, such as absolute momentum, can help reduce downside exposure in long-term bear markets, but they do little to reduce uncomfortable short-term volatility. Trend following is also less effective when applied to value factors than when applied to other factors like momentum. All three of these problem areas for single factor investing – tractability, scalability, and volatility – can be reduced some by using intelligently constructed multi-factor portfolios. Multiple factors reduce tracking error, since it is unlikely that several factors will substantially underperform at the same time. As for scalability, if a fund uses four factors instead of just one, it can handle four times the investment capital without eroding its ability to enter and exit the markets. Finally, you can sometimes reduce the volatility and bear market drawdowns associated with value and momentum factors by combining these factors with less volatile ones, such as quality and low volatility. An issue associated with multi-factor funds, however, is their average annual expense ratio of 41 basis points for what are often enhanced index funds. 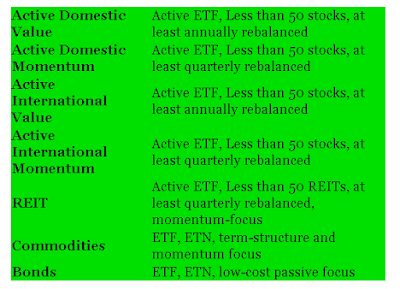 Until recently, an investor who wanted multi-factor exposure would have been better off creating it herself by combining the single factor iShares MSCI USA Value Factor, USA Momentum Factor, USA Quality Factor, and USA Minimum Volatility ETFs, since these all have expense ratios of only 15 basis points. • Value: The value measurement is a composite of three valuation measures, which consist of book value-to-price, sales-to-price and free cash flow-to-price (earnings-to-price ratios are used for financial stocks or where free cash flow data are not available). • Momentum: The momentum measurement is based on beta- and volatility-adjusted daily returns over an 11-month period ending one month before the rebalancing date. • Quality: The quality measurement is gross profit divided by total assets or return on equity (ROE) for financial stocks or when gross profit is not available. • Low Volatility: The volatility measurement is the inverse of the standard deviation of past 12-month daily total stock returns. Even though the fund holds 432 stocks out of an investable universe of 500, it uses a weighting scheme that allocates more of its capital to stocks with high factor ratings. GSLC rebalances positions quarterly and uses a turnover minimization technique (especially useful for momentum stocks) of buffer zones to reduce the number of portfolio transactions. The fund came into existence because some of Goldman’s largest clients wanted to invest using an ETF wrapper to reduce their tax consequences. Because of this sponsorship, the fund was set up with an annual expense ratio of only 9 basis points. This is the same expense ratio as the biggest and most popular ETF in the world, the SPDR S&P 500 ETF Trust (SPY). GSLC already has $78 million invested in it since coming to market one month ago. GSLC does not have a trend following filter like absolute momentum to help it avoid severe bear market drawdown. GSLC is also unable to enjoy international diversification during those times when international stocks show greater relative strength than U.S. stocks. Its future performance also may not be as good as expected, since, like most other factor ETFs, GSLC relies on data mining to determine its factor parameters. Nothing contained herein should be interpreted as personalized investment advice. Under no circumstances does this information represent a recommendation to buy, sell or hold any security. Users should be aware that all investments carry risk and may lose value. Users of these sites are urged to consult their own independent financial advisors with respect to any investment. See Novy-Marx (2015) for details on multi-signal bias issues. GSLC has an annual fee waiver of 15 basis points until September 14, 2016, after which time it has the option to raise its expense ratio up to 0.24. Whether or not fees are raised often depends on asset growth.